This is a follow-up post to an earlier entry where I noted an off-hand comment by US coach Chris Grover that when Kikkan Randall qualifies in the top ten in a sprint race, that this is a good sign that she has a good chance of making it to the finals. I looked at some data and concluded that it mostly supported his claim, but that the sample sizes were small enough to not mean much, from a statistical point of view. It was suggested in the comments that I look at this overall, for all skiers and see what, if any, relationship there might be. Generally speaking, I think we shouldn’t be terribly surprised about a correlation between one’s performance in qualification and one’s performance in the heats. It just makes sense that, on average, the faster sprinters will do better in qualification. This covers all sprint races since 2005-2006. I’ve blocked off the various regions using some overlapping rectangles to indicate the top ten in qualification and the top six in the finals, and the various combinations of those two conditions. 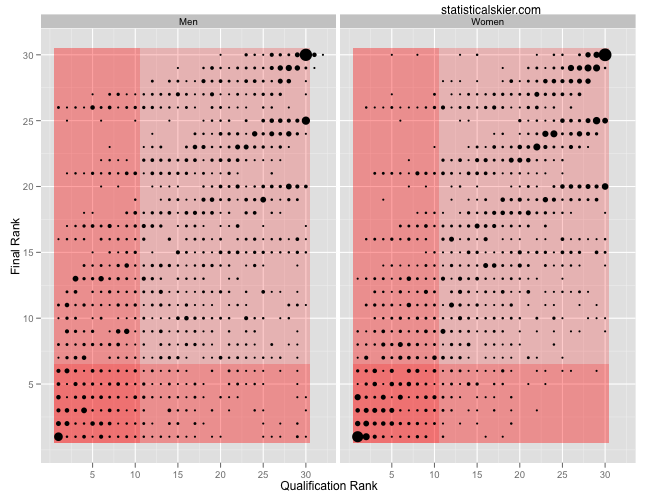 The size of the dot represents how often that particular combination of ranks occurred across all athletes. There are a few rare instances where someone qualified above 30th but eventually made it into the top thirty. This is due to the occasional disqualification or dropping out prior to the heats. The somewhat boring formal statistics going here is that we’ve defined two binary variables (top ten in qualification or not, and top six in final rank or not) and the question is whether there’s a relationship between the two. There are all sorts of ways you could approach this (two-way tables and chi-squared tests, ANOVAs, generalized linear model, etc.) but I’m not going to bore you with the details. Let’s just calculate the raw proportions. The proportion of times men who qualified in the top ten went on to the finals is 0.396. The proportion of times men who qualified outside the top ten advanced to the finals was only 0.102. For the women, the difference grows larger: 0.48 versus 0.06. Posted by Joran on Monday, December 27, 2010, at 6:00 am. Filed under Uncategorized. Tagged andrew newell, kikkan randall, qualification, Sprint. Follow any responses to this post with its comments RSS feed. You can post a comment or trackback from your blog.